The Republic of Equatorial Guinea is set to expand its energy opportunities with the examination of a second floating liquefied natural gas (FLNG) project with OneLNG. The Ministry of Mines and Hydrocarbons entered a binding agreement with OneLNG to explore the liquefaction and commercialization of offshore natural gas. The details of the agreement are targeted to be set by the end of 2017. OneLNG, along with Ophir Energy, are currently developing the $2 billion Fortuna FLNG project, set to transform Equatorial Guinea’s energy offerings and establish the country as a regional hub. Fortuna FLNG will be Africa’s first deepwater FLNG project. The Republic of Equatorial Guinea has prioritized women’s health with the launch of the Early Diagnosis, Prevention, and Treatment of Cervical-Uterine Cancer Project, which aims to develop more population information regarding cervical-uterine cancer, and work to prevent cases from increasing further. Preparatory work began on the Project in February with visual inspection of acetic acid and thermal clotting. The Government of the Republic of Equatorial Guinea has guaranteed universal access to sexual health services and set up a program of reproductive health in order to prevent and eliminate cervical-uterine cancer. The Project was launched at the Doctor Damián Roku Epitie Monanga Hospital in Bata. 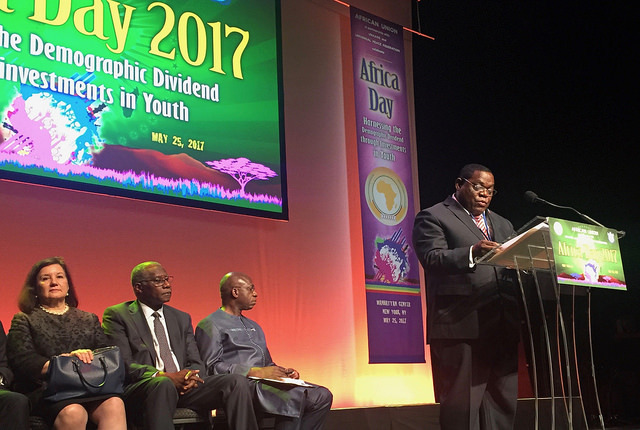 The Republic of Equatorial Guinea has prioritized energy development in regards to gas and oil exploration and production with the sponsorship of the international Africa Oil & Power (AOP) 2017 conference by Equatorial Guinea Ministry of Mines and Hydrocarbons. The Ministry will explore potential partnerships and investments with international energy firms, as well as discuss the future of energy investments and policies for the future of Africa as an international energy hub. Equatorial Guinea has been recently approved to join the Organization of the Petroleum Exporting Countries (OPEC), which will make it the 14th member and sixth from the continent of Africa. Equatorial Guinea also recently announced an agreement with Arabian Energy DMCC to collaborate on the Bioko Oil Terminal. The Terminal will transform the country’s energy sector and establish Equatorial Guinea as a trading hub for all of West Africa. AOP 2017 will be held in Cape Town, South Africa. The Vice President of the Republic of Equatorial Guinea charged with Security and State Defense, Teodoro Nguema Obiang Mangue, highlighted the importance of national and regional security and keeping the peace in the recent opening of the Community of Portuguese Language Countries (CPLP) meeting. The Vice President highlighted the developments Equatorial Guinea has undertaken in the community and requested support for Equatorial Guinea military cadets to higher training centers in order to further strengthen security and peace capabilities. The Vice President emphasized the importance mutual cooperation between Equatorial Guinea and countries in the CPLP. He also pointed out the historical connection between Equatorial Guinea and the Portuguese, citing the country’s discovery by Portugal’s Fernando Po. The CPLP meeting took place at the Palace of Conferences in Sipopo, Equatorial Guinea’s world-class conference facilities which have hosted international gathering such as the African Union Summit and Africa-Arab Economic Forum to name a few. 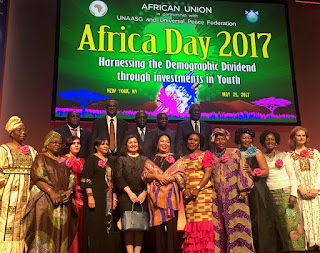 Equatorial Guinea’s Deputy Minister for Foreign Affairs and Cooperation, Salomón Nfa Ndong, called on the African Union (AU) member countries’ support for its candidacy as a non-permanent member of the United Nations (UN) Security Council at the Africa Day celebration, held at the Manhattan Center in New York. During his opening remarks, delegate minister said that more than 70% of the subjects addressed in the Security Council relate to Africa; however, Africa is the only region that has no representation in the Security Council as a Permanent Member. The Republic of Equatorial Guinea has been a member of the UN since the 12 of November of 1968, but this is the first time that the country is postulated as a candidate to the post of a non-permanent member of the Security Council. The candidacy of the Republic of Equatorial Guinea as a non-permanent member of the Security Council was backed by the AU during the Summit of Heads of State and Government held in June 2015 in Johannesburg, South-Africa. The Africa Day ceremony marked the 54th anniversary of the founding of the Organization. UN Security Council elections for the 2018-2019 period will be held at the UN on June 2. The Republic of Equatorial Guinea has strengthened United Nations (UN) relations ahead of the key Security Council elections, for which Equatorial Guinea is vying for a seat. Equatorial Guinea officially opened diplomatic relations with fellow UN member the Republic of Kazakhstan in an effort to strengthen bilateral cooperation and areas of mutual collaboration. The Equatorial Guinea Deputy Minister for Foreign Affairs and Cooperation, Salomón Nfa Ndong, and Permanent Representative before the UN, Anatolio Ndong Mba, and the Ambassador to the United States, Miguel Ntutumu Evuna Andeme, met with the Permanent Representative of the Republic of Kazakhstan, Kairat Umarov. The meeting, which took place at the Equatorial Guinea Permanent Mission in New York, aimed to promote increased bilateral understanding and mutual collaboration. Equatorial Guinea has requested to become a non-permanent member of the UN Security Council and called for more equitable representation in order to tackle new challenges in the world today. The Republic of Equatorial Guinea has prioritized infrastructure investment and development to offer the best services and resources for Equatorial Guineans and those who visit the country. Equatorial Guinea announced the modernization of the Bata airport is moving ahead, with the acquisition of a modern aviation computer system and time control center to improve aviation security and efficiency. Bata is an important economic hub in Equatorial Guinea and has received significant infrastructure and development attention from the government of Equatorial Guinea. The equipment will be installed with the support of the Agency for Aerial Navigation Safety in Africa and Madagascar (ASECNA).